If you love sniper rifles, then you will probably enjoy sniping all sorts of things with the Double Eagle M59p. 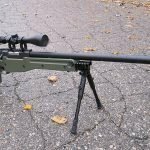 There is nothing fancy about this bolt action airsoft sniper rifle, but it is a ton of fun and you can expect tremendous sniping satisfaction out of it. The M59p is actually modeled after the L96 sniper rifle and it happens to be the British Army’s sniper rifle of choice. At 100 to 150 feet, the M59p’s accuracy is dead-on. However, the most awesome thing about the M59p is the smoothness of its spring power bolt. Pulling the bolt all the way back after each shot and then pushing it forward so you could fire your next shot is just so easy, and the whole process really makes you feel like a one mean sniper ready to blow away your targets. You will have so much fun using this rifle that it won’t take long for you finish the sample pack of BBs that are included with the M59p. The sample contains about 150 or so 0.25g BBs and that is the perfect ammo for this rifle. Some users had stated that they received a pack of 0.20g BBs instead 0.25g. Now, both types of ammo are good for this airsoft sniper rifle with scope and bipod. So you do not have to fuss over which type of ammo is worthier to be loaded into your precious M59p rifle. With 0.20g BBs loaded, expect the FPS to be around 430 to 440. The M59 comes with a magazine that can hold 30 BBs and that is quite a decent capacity. The magazine is about 2 to 3 inches long and there is a hole for you drop the BBs. Of course, putting in 30 BBs in the magazine can be an extremely tedious affair, so the manufacturer was thoughtful enough to supply a manual speed reloader, which has capacity to store approximately 100 BBs. Thanks to the speed reloader, reloading your bolt action airsoft sniper rifle can be done real fast and easy. Installing the rifle’s magazine is even easier. All you need to do is slide the magazine in place and keep your ears open for a couple of clicking sounds. If you hear only a single clicking sound that means you did not install the magazine correctly, so you won’t be able to fire the rifle. Another thing that can prevent you from firing the rifle is of course, the safety switch. 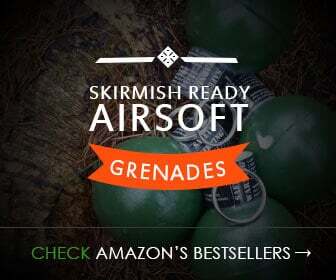 The safety works like most airsoft sniper rifles. There is a switch and you just push it forward to enable firing. Pulling the switch back disables the trigger. You can no longer pull the trigger, but the rifle’s bolt can still be pulled back. The 39×32 scope is just terrific. You have the ability to change the color of its crosshairs to either green or red and the magnification is excellent. If the M59p has a fault, it’s that the magazine feels cheap. 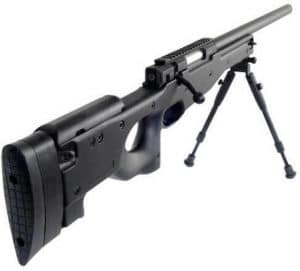 The M59 is just a basic spring airsoft sniper rifle, but sniping fans as well as beginner snipers will appreciate its accuracy, ease of use, and its ability to provide authentic sniping experience. 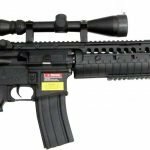 Quality airsoft sniper rifle with great accuracy and accessories. 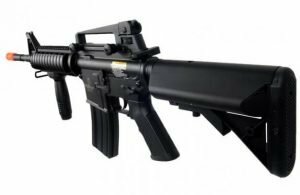 The Double Eagle M59P is an authentic looking L96 airsoft sniper rifle, shooting around 460fps it packs a punch and is great for the field.